Denis Naughten, Minister for Communications, Climate Action and Environment and First Minister of Scotland, Nicola Sturgeon presenting the SSE and Coillte Winter Wildlife and Habitats photographic competition winner to Grace Hooper, (age 13) St Pauls Secondary School, Oughterard, Co Galway with her photo titled ‘Snow capped mountains’ Roscahill, Co Galway. Picture Conor McCabe Photography. 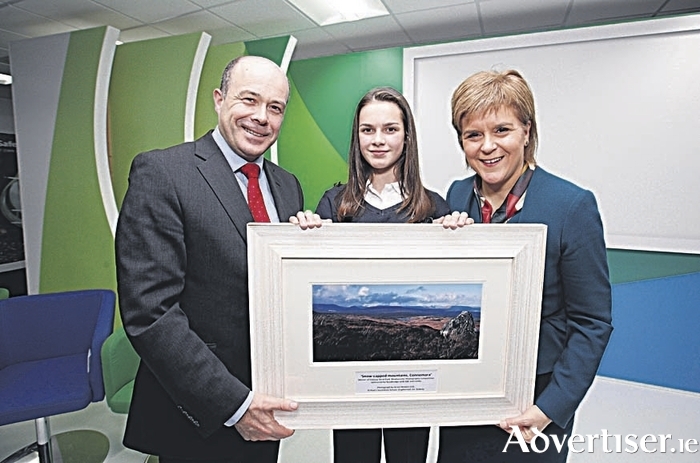 School pupil Grace Hooper from St. Paul’s Secondary School in Oughterard, Co. Galway, presented her prize-winning photo ‘Snow-capped mountains, Connemara’ to First Minister of Scotland, Nicola Sturgeon, and Ireland’s Climate Action Minister Denis Naughten at the Galway Wind Park event held at green energy provider SSE Ireland’s HQ in Dublin on Monday. First Minister Sturgeon and Minister Naughten were in SSE’s offices to launch a Sustainability Impact Report into the 169MW Galway Wind Park which is being jointly developed by SSE and Coillte. The report outlines the valuable economic, environmental and social impacts that SSE and Coillte’s Galway Wind Park project is delivering locally and nationally. As part of the project’s education outreach programme, the main civil works contractor, Roadbridge, ran a school photography competition in to raise awareness of biodiversity among young people, and to encourage local students to explore the countryside around them. Grace (14 ) saw off competition from 44 other entries with her photo of snow-capped mountains and the Connemara landscape. After presenting her picture to both ministers, Scottish First Minister Nicola Sturgeon surprised Grace by presenting her with her own personal framed copy of her own picture. Page generated in 0.1772 seconds.